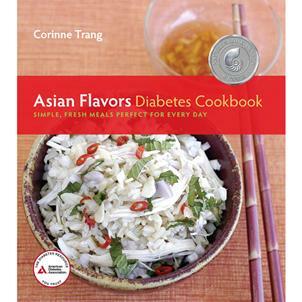 The Asian Flavors Diabetes Cookbook is the first book that takes the elegant, easy to prepare, and naturally healthy recipes and meals of Asian cuisine and crafts them specifically for people with diabetes. Featuring more than 110 simple comfort foods from all over Asia, the Asian Flavors Diabetes Cookbook focuses on healthy cooking techniques—such as steaming, stir-frying, braising, and grilling—from which you can create a myriad of delicious, balanced dishes that bring together body, mind, and spirit. Corinne Trang is the award-winning author of several books, including: Noodles Every Day, Curry Cuisine, The Asian Grill, A Food Lover’s Companion: Vietnamese, Essentials of Asian Cuisine, and Authentic Vietnamese Cooking. Dubbed the "Julia Child of Asian Cuisine" by the Washington Post, she has been a guest on numerous shows, including NBC’s Today Show, The Martha Stewart Show, CBS News, ABC News, Fox News, and Bloomberg Radio. Her articles have appeared in Saveur, Food & Wine, Relish, Cooking Light, Fine Cooking, Gourmet, Islands, and Bon Appetit.